Thinking about becoming a bidorbuy store? bidorbuy Stores provide small-medium sized businesses with a low-cost and highly effective way to increase sales. With the increased promotion you can capitalise on access to South Africa's thriving online marketplace. bidorbuy Stores are a low cost way for a small business or companies to break into e-commerce. For a low monthly subscription fee, you can make your products available to a huge audience at a fraction of the cost of developing and promoting your own website. If you are interested in setting up your own bidorbuy store, please read the following information. Step 1. Learn about selling on bidorbuy and get familiar with how online auctions can help your business. Step 2. Sell some items on bidorbuy. 50 positive ratings from buyers are a minimum requirement. Step 3. Talk to one of our customer service representatives. We will work with you to understand your requirements. Step 4. Sign a contract with us. Step 5. Provide us with your company information, logo and relevant information for your store. Step 6. We help build your bidorbuy Store. Step 7. Load your products. Would you like to get started with your own bidorbuy store? Please send us an email to stores@bidorbuy.co.za and we will get back to you as soon as possible. Stores must adhere to the standard bidorbuy Terms and Conditions. The terms and conditions are subject to change. You are expected to keep up-to-date with any changes. Stores must maintain a minimum of 10 concurrent listings. Stores must have a commitment to sell through bidorbuy. It is not permitted to provide buyers incentives to buy outside of the bidorbuy process. Stores must not make efforts to solicit direct sales through their own website, email or other channels outside the bidorbuy process. You must be familiar with selling on bidorbuy, having a minimum of 50 positive ratings from buyers. bidorbuy, in its sole discretion, may decide to waive this. Your feedback rating must be 98% positive or higher at all times. Should your ratings drop below the set limit bidorbuy reserves the right to remove your store profile. You need to provide a minimum 30-day warranty on sales and have a commitment to customer service and mediation of any disputes. You must offer bobPay as a payment option. Depending on the store type, you might be required to offer bobPay credit card together with bobPay EFT. Store fees are to be paid in advance on your bidorbuy account. You must maintain a consistent product range. Changes to the type of products you are listing must be declared to us in advance. 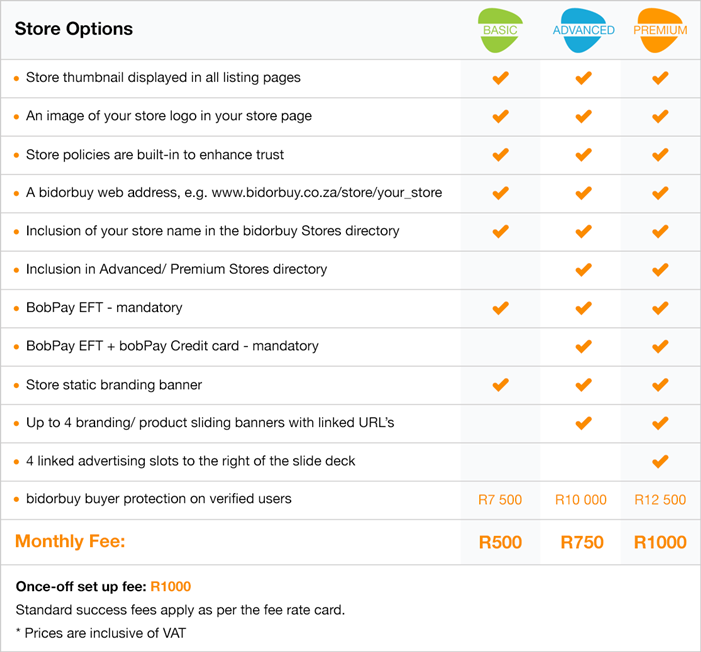 In order to keep your status as a bidorbuy store, it must generate an average of R1,000.00 in success fees each month. Please see the bidorbuy success fees rate card. This represents monthly merchandise sales of R20,000 - R30,000 per month. Stores are not permitted to operate person-to-person selling functionality on their own websites. bidorbuy reserves the right to remove stores that breach the terms and conditions with 5 business days notice in writing. Non payment of any fees will result in your store being downgraded to normal selling status and that bidorbuy, in its sole discretion, may decide to re-enable your account for Store status once payment has been received. A nominated individual must be responsible for all activities of your store. You must comply with the Consumer Protection Act and all other relevant South African laws.